I'm getting ready to prepare for my version 2.0 of truffles. And I have some improvements planned. (1) Use a much higher quality of chocolate. I've splurged a bit on what's considered to be some of the world's best chocolate, used by professionals, or so my Bon Appetit tells me. Bought about 10 oz. of Valrhona 70% bittersweet dark chocolate (which is supposed to have a fruity nutty taste? 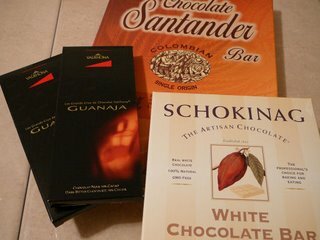 ), 2.2 lbs of Satander 70% bittersweet dark chocolate (it hails from Colombia), and some Schokinag (not quite as good I think), white chocolate. The Valrhona claims that they still use the same method of preparation as when Christopher Columbus tasted when he first arrived in the US. I'm still waiting on about 1 pound of bittersweet dark chocolate from Callebaut as well that will arrive sometime next week. (2) Prepare my ganache differently. Chop the chocolate into smaller, more uniform pieces. Simmer the heavy cream, and add it to the chocolate and use the heat from the cream to melt the chocolate. Smooth out with an immersion blender. (3) Prepare some different flavors. I'm thinking of the usual dark chocolate, plain white chocolate enrobed in dark chocolate, bought some hazlenuts (didn't know they were the same as filberts) which I will toast and dice up, mocha chocolate truffles, orange white chocolate truffles with a dash of grand marnier. (4) Presentation: scored some deals on lovely gift boxes at Michael's.